Microsoft Project 2010 is used to track and manage your projects. Building a foundation in Project 2010 requires an understanding and use of the many features of Project 2010 such as resource management, using task lists, sorting, grouping, scheduling, handling conflicts and much more. 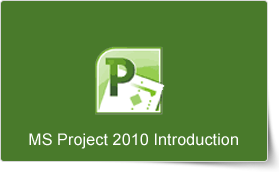 The PD Training Microsoft Project 2010 Introduction Training Course provides professional training in the development of basic skills in Project 2010 to empower you to use the application to effectively manage and monitor your projects. This Microsoft Project 2010 Introduction Training Course can be delivered at your premises by one of our expert local or international trainers or live online using our HIVE technology. This Project 2010 Introduction training course running in Central, teaches the basic commands and features of Microsoft Project 2010. Participants will learn how to create and modify task lists, establish a project schedule, create calendars, assign resources to tasks, track costs, and work with different views and tables. Participants will also apply filters and groups, and sort task and resource data. Finally, they will learn how to resolve resource conflicts.